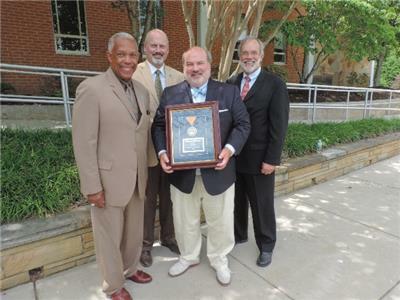 John Morgan, Tennessee Board of Regents chancellor, awarded Cleveland philanthropist Allan Jones, CEO and founder of Check Into Cash, Inc., with the Chancellor’s Award for Excellence in Philanthropy for his donations and his volunteer efforts in raising funds for Cleveland State. Mr. Jones received this honor on Tuesday afternoon during an outdoor media conference on the main CSCC campus. Officials said, "A generous donation by Jones made it possible for tnAchieves to launch its last dollar scholarship and mentoring program in all three Bradley County high schools, resulting in the bradleyAchieves program. His contribution has allowed hundreds of graduates from Bradley Central, Cleveland and Walker Valley High Schools to receive a degree from Cleveland State tuition and fee free. Since its inception in 2011, the bradleyAchieves program has helped approximately 620 students." Mr. Jones is a 1972 graduate of Cleveland High School. While at CHS, he enjoyed success in wrestling and playing on the football team. Upon his graduation from high school, Mr. Jones enrolled at Middle Tennessee State University to pursue a degree in Business Management; however, in 1973, health issues facing his father, William A. “Bill” Jones forced him to put his education on hold in order to help run the family business. He later enrolled at Cleveland State Community College, but the growing demands of running the family business prevented him from obtaining his degree. Running his father’s business seems to have afforded him real life experience as he found himself being able to purchase his father’s small business, the Credit Bureau of Cleveland. Under his leadership, the bureau was able to create the largest bureau databases in the state. In 1988, Mr. Jones decided it was time to take the business in a different direction. He sold the credit reporting side of the business to Equifax, while he retained ownership of the collection agency division. In 1998, after growing the collections company to the largest in Tennessee, he sold that company in order to focus on Check Into Cash which he had founded and serves as the CEO. Mr. Jones is also the founder and CEO of Jones Management Services, which he began in 1996. Officials said, "What makes Jones the most proud is finding ways to give back to Bradley County and other communities that hold a special place in his heart. He is an avid historian and can often be found contributing to causes that help preserve the history of Cleveland and Bradley County. He has contributed to his alma mater, Cleveland High School, by donating funds to build a wrestling complex. Additionally, he founded MainStreet Cleveland and began the tradition on Centenary Avenue of providing grand Halloween celebrations for the entire community." Honorees for the Chancellor’s Award are selected by the TBR Donor Recognition Committee which is comprised of two university representatives, two community college representatives and two technology center representatives. In addition to the Chancellor’s Award for Excellence in Philanthropy, Mr. Jones was awarded an honorary degree from Cleveland State during its 49th Commencement Ceremony on Saturday, at which he was the keynote speaker. This was the first honorary degree the college has ever awarded.